Stems: Aerial stems absent. Herbage usually aromatic; from branched and creeping rhizomes. Leaves: Basal, simple, crowded, erect; stipules absent; petioles absent; blade bright green, linear, 35 to 40 inches long, 1/3 to 1 inch wide, sword-shaped, parallel-veined, midvein usually off-center, margins entire. Inflorescences: Spadix subtended by erect, leaf-like spathe, 8 to 24 inches, which extends beyond spadix; spadix diverging from scape, cylindric, 1.6 to 3.6 inches long, .2 to .4 inch wide, tapered, apex obtuse. Flowers: Bisexual; radially symmetric; tepals 6, distinct; stamens 6, distinct; style 1; stigma 1. Fruits: Fruits are not produced. Uses: Introduced to North American for its medicinal uses. Native Americans used sweet-flag as a medicine and for ceremonial uses. It provides habitat for waterfowl. Comments: This species is a sterile triploid. 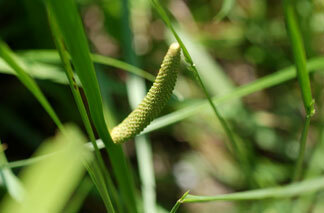 Acorus historically has been placed in the Araceae. The name Acorus calamus long has been applied to North American plants, but evidence supports recognition of two species: the European A. calamus and the native A. americanus (Raf.) Raf. Acorus americanus occurs in eastern Nebraska but has not been found in Kansas.